A police presence remains at the house where the bomb squad was called in following searches connected to the Manchester terrorist attack. A Greater Manchester Police (GMP) van was parked outside the property on Springfield Street in Swinley on Friday morning. Officers stood outside the property preventing anyone gaining access. 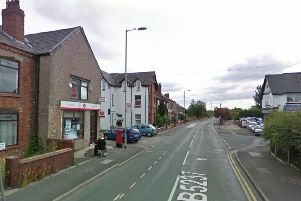 The quiet residential street close to Wigan Infirmary was the scene of dramatic events on Thursday night after bomb disposal experts were called in to examine a number of “suspicious items”. Dozens of residents were evacuated and kept from their homes for more than two hours as a large cordon was put in place. A controlled explosion was not carried out and people were allowed back in their houses when the cordon was lifted at around 9.30pm. It is unclear if police were still searching the property on Friday. The borough has been the scene of intense police activity, with bomb disposal teams being called to Upper Dicconson Street on Swinley on Wednesday afternoon when a man was also arrested in connection with Monday night’s terror attack. Wiganers have also show their defiance with public vigils to remember the lives lost and fund-raising appeals bringing in thousands of pounds to support the victims and their families.